Happy new iPad day! 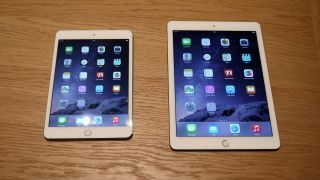 If you're eager to get your hands on one of Apple's new slabs, we've got all the key information you're going to need: find out about the improvements to Apple's tablet line in the iPad mini 3 and the iPad Air 2. Apple's sleek fingerprint recognition tech has made it to both new iPad models and it's about more than just keeping your kids away from Modern Combat and your collection of Saw movies: third-party developers can push ahead with tighter integration on apps and web services without worrying about you switching from an iPhone to an iPad and breaking the chain. Then there's Apple Pay, of course, previous announced by Apple and launched in the US alongside the iPads at the event: you can use Touch ID and Apple Pay on the iPads to confirm your online purchases, for example. With fingerprint identification arriving on the iPads, Apple finally has its next-generation security system on all its flagship mobile devices. The iPad mini got a significant bump in display quality last time around so this year it sticks with the same formula, a 7.9-inch, 1,536 x 2,048 pixel, 326ppi screen for enjoying your movies, television shows and games. We got a real treat in 2013 with the mini's upgraded display so we can't complain too much. The iPad Air 2 doesn't get a screen upgrade either: the 9.7-inch model is still running at the same 1,536 x 2,048 pixels (a ppi of 264). What the iPad Air 2 does get is a small boost in terms of materials, coming with an anti-reflection coating that makes it easier to see in daylight. The new A8X chip inside the new iPad Air 2 is a welcome surprise (and promises a 40% power increase over its predecessor) though the iPad mini 3 sticks with the older A7 option from last year. The Air 2's updated chips give the tablets extra grunt for powering those large displays and means your games, apps and websites should run smoother than an Apple PR machine. The extra performance will make the most difference in the graphics department, which is good news for all those high-resolution, visually intense games you're going to be installing. We're expecting the RAM gets a boost from 1GB to 2GB in the iPad Air 2 as well. We know that Jony Ive spends all year in a workshop trying to shave an extra millimetre or two off the iPads each time around, and he's repeated the trick. The iPad Air 2 slims down to just 6.1mm (down from 7.5mm) and earns the title of the thinnest tablet on the market. The weight of the tablet drops a smidgen too, meaning it'll feel even lighter in the hand. There's not as much love for the iPad mini 3 - something of a running theme at the launch - and the smaller model has the same dimensions and weight as its immediate predecessor. Essentially it's a minor bump to introduce Touch ID, though there is a new gold champagne colour on both models. Apple's iPads have always had a solid reputation as far as battery life goes and it looks like this year's batch will be no exception (we'll reserve full judgement until we get chance to review them, though). Despite the more powerful hardware inside the tablets, estimated battery life remains the same. Last year's models were all identical in offering 10 hours' worth of use and 9 hours of surfing the Web, and this year's editions - both the iPad mini 3 and the iPad Air 2 - are going to match that, according to the information provided by Apple during its launch event.